Although 3 of the puppy walkers were unable to make our first training session we decided to run the session anyway to get the ball rolling. We started with a demonstration with my old Police dog Spud on what tracking is all about with Ava, Annie, Axel and Arry all watching with interest. 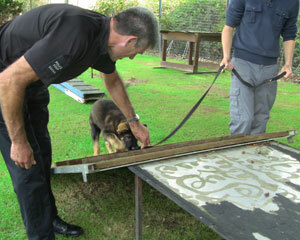 We then gave all 4 pups an introduction to tracking using hot dog sausages. Initially small pieces of hot dog sausages are placed in every scuffed footprint which the pup follows to get the food. 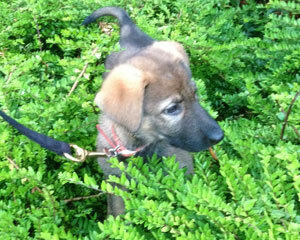 After several sessions the pups make the association that by following human scent and disturbed ground they find food. Eventually as they become more and more proficient less food drops are placed out and eventually the food is replaced with the pup’s favourite toy. 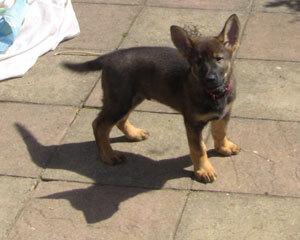 Puppy Ava showing intense tracking concentration and looks a natural. 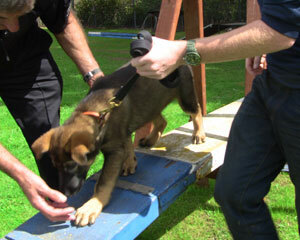 Arry negotiating a steep ramp on the agility course again using titbits. The agility course just builds the puppie’s confidence on the various ramps, tunnels and walkways. No actual jumping takes place at this age for obvious reasons. Arry enjoying being in the tunnel so much he has decided to stay in there. A very determined Axel not keen to let go of the toy. He will soon learn that by letting go of the toy it immediately comes alive again and the game continues. Also note the tennis ball will soon be discarded as they are extremely dangerous for bigger dogs. There is no danger to Axel at this stage as the ball is on a rope and is too large for Axel to swallow. It fills me with dread seeing people playing with a tennis ball or small rubber ball with a larger dog because if the dog swallows the ball it is almost impossible to get the ball out and the dog will be asphyxiated. Annie showing intense concentration as she negotiates the walkway with Ollie and myself making sure she cannot slip off the sides. The pups all meeting at the start of the session and if you look closely Ava in the centre is clearly showing she is not comfortable with the other pups all crowding and pressing her. This is an excellent example to show it is not a good idea to just let pups jump on each other and play fight. Often what happens is the more assertive pups just become better at fighting and rough housing and the less assertive become wary of approaches from such dogs. 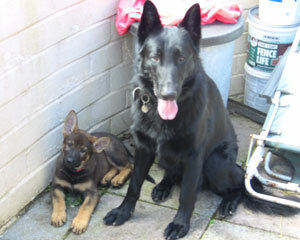 Far better for young pups to meet older sensible dogs and learn to be well mannered and social. Ava getting very excited meeting Cleo who is doing just as Ava’s mother Ruby used to do ie gently holding her muzzle to calm her down. Ava very quickly relaxed in Cleo’s company. At the end of the session we all went back for a coffee and a chat to talk about any behaviour or training queries anyone might need advice about. 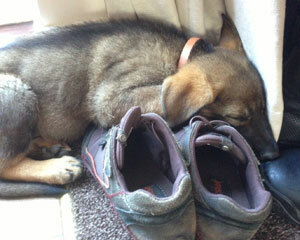 So that was it a very successful first training session on the long road to becoming a Police dog. 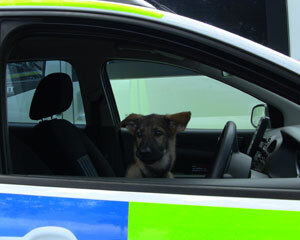 Ava just trying out a Police dog van for size and looking very much at home. Since the puppies left for their new homes we have hosted an assessment centre to select new dog handlers for our forthcoming Initial Police dog course starting on the 9th of September. As anyone who has taken part will tell you this is a very physically and mentally demanding week. 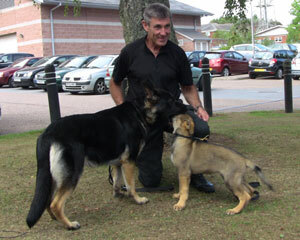 Police officers wanting to become dog handlers are assessed on their individual skills, team skills and their affinity and ability to care for one of the older dogs from our puppy scheme who they look after for the week. I also had to assess 9 of the older pups in our puppy scheme to see if they have the necessary qualities and skills to start on an Initial Police dog course. Five dogs are required for our Initial course starting on the 9th of September and the remainder will be going to outside forces. I will be outlining how the assessments went in my next blog. In amongst this I have been training the January pups and visiting the A litter puppy walkers to make sure they were all coping alright. The main issue for most of them was their pups not sleeping through the night but I am happy to say they are all now fully settled in and thriving. Here are a few pictures of the pups at their new homes. 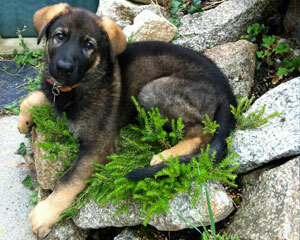 AXEL chilling in his garden in Launceston where he lives with Steve, Maria and their girls Faye, Laura, and Grace. 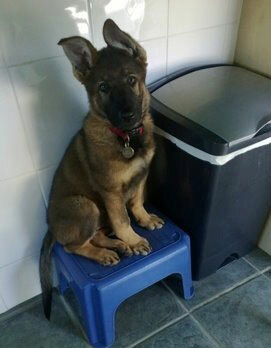 Ash in Redruth sitting patiently waiting for her puppy walker Annie to open the food container. 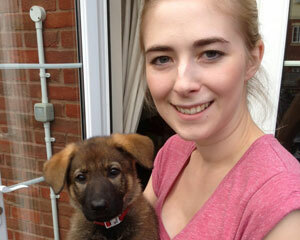 Ava who lives in Exeter with puppy walkers Ed and Lowri. Seen here with Lowri. and later hiding in the bushes. 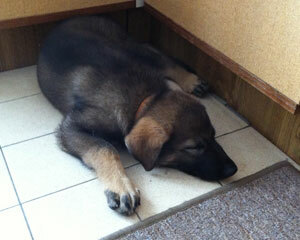 Anya who lives in Hennock with Graham, Lucy and the girls pictured taking a nap in the kitchen. 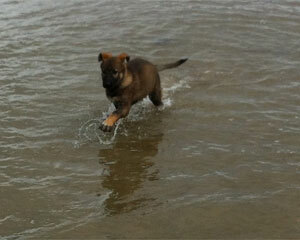 Anya on holiday this week in Donegal playing in the sea. 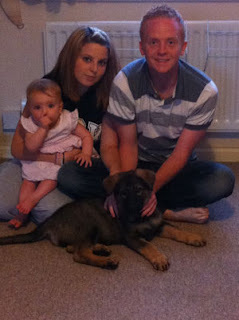 Annie settled in her new home in Paignton with all the family Ollie, Leanne and 10 month old daughter Millie. 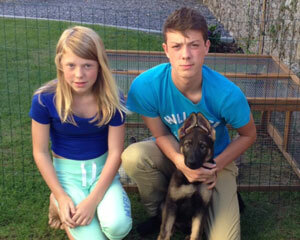 Argo who lives in Plymouth with Lyn and John Parlour pictured in the yard and hopefully one day he will grow into those ears. Argo alongside his buddy Jack. Jack has also been puppy walked by Lyn and John and is just waiting for further assessment prior to allocation to a Police dog handler. 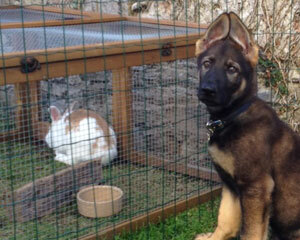 Arry is pictured saying I am not looking at the rabbit honest. Arry with Ella and Josh. 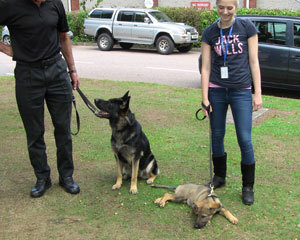 Spotlight filmed the handing over of the puppies to their puppy walkers.